The Landeez All-Terrain wheelchair has served us very well over the first 10 years of Beach Within Reach. Last year we discovered that the Landeez was no longer being manufactured and this is the main reason why we are moving on to the new De-Bug chairs. 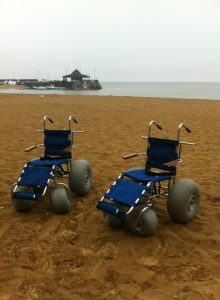 You will still some Landeez wheelchairs on our beaches for a while yet but as we raise the money to replace them they will eventually be phased out.